Two stories have dominated the F1 headlines this week: the WMSC hearing of McLaren's defense to the charge of bringing the sport into disrepute and the apparent departure from and then return of Scott Speed to the Toro Rosso team. Debate regarding the WMSC's decision continues but, just to wrap up my posts on Speed (The Trouble at Toro Rosso and Silly Season Tensions), a final look at the story would not go amiss. Probably all observers (including myself) thought that Scott was effectively out of STR after hearing of Tost's reported assault on him at the European GP and the American's subsequent statements to the press. It came as some surprise, therefore, to learn that he attended the Mugello test as scheduled and that Tost declared that Scott would drive for the team in the forthcoming Hungarian GP. Yet even in Adam Cooper's report of his interview with the young driver, in which Scott declared that no amount of money would lure him back to the team, there was a hint that things were happening; the interview was conducted during Scott's drive to Mugello for the test, leaving one wondering why he should be on his way there at all. Scott's father gave the clue to what was really happening at the time. He told SpeedTV that "things were happening behind closed doors" and, presumably, Scott was on his way to Mugello in case a solution was arrived at. The comment about money was almost certainly made in the heat of passions re-aroused during Scott's account of the events at the Nurburg. Obviously, some agreement has been achieved. We can speculate on how this happened but will probably never know the full story; it seems likely that the bosses of the parent team, Red Bull, who are also Speed's sponsors through their youth program, had something to do with it all, however. Whether Scott sees out his contract for the rest of the year remains to be seen. Personally, I hope he does for he has developed beyond his team mate, Tonio Liuzzi, and regularly turns in good performances when the car allows it. At the Mugello test, Speed put in better times than Liuzzi's on both Wednesday and Thursday, in spite of being handicapped by the tensions of preceding events and a very painful back. It may be that the saga will do some good in the end. Scott's STR bosses, Franz Tost and Gerhard Berger, may think twice before criticizing their drivers in future and they might concentrate more on the team's real problems as a result. And there is no doubt that the upset has raised Speed's profile immensely; the general feeling in the F1 forums has been one of approval that Scott should have stood up to such unfair treatment and many are re-assessing his abilities as a driver. No longer do I hear the oft-repeated charge that "the only thing wrong with STR is its drivers". Since it was really long ago i made a comment here, i believe it is time for me to make a retur here. The saga about Scott Speed have really begun to spinn around now, and i don't think that all things said can be true. But a problem always have more than one side, and if the team feels that their drivers are doing ok during races, and doing well during training looking driving-wise, there may be ather issues. As an example i would like to reflect on how Speed sounds when talking to the team over the radio. I can't say that the feedback i have heard would give me any good ideas about the current happenings in the car since he really sounds like he is doing more of a sunday morning radioshow than giving real feedback to the team. If that is what is going on, that certainly would be one of the things adding to the irritation in the team. And even i he seems to be a really nice guy, i am going to have a hard time taking him seriously in the future, after he said all the things he said recently in the press. Saying such things, then just over night beeing back in the team and just forgetting it have ever happened, really don't make me looking at him in a serious manner. About the records of his current racingresults, hee certainly seems to have caught the raikkonen-flu. Bad luck is something that can be really costly in F1. At last i would like to give some comments on the new layout at the site. And i really think it looks awesome. Since i have never understod why webpages always have to be bright and shiny and make your eyes sour, i have always been a fan of dark layouts of webpages. The colours used really makes the page complete, with the dark background, orange and white texts. Much easier on the eyes, and wont make one get a headache. One thing i feel is a little over the top might be the use of a verificationpicture to be able to ad comments. I have not seen many spam-postings, and the ones added have'nt been so harmful i think. Thanks for keeping this place going, i love it and will be staying here as long as the page remains. Thanks for the comments re the new site, Bjorn - my son will be really pleased that his hard work is appreciated! When he first suggested a dark layout to me, I was a bit horrified but allowed him a completely free hand in the design - as a web designer he knows his stuff and so I trust him. And the result just wows me every time I open the page. As regards the verification image, we have had a persistent spammer hitting one of the posts at least twenty times a day and, having tried everything else to block him (or it - it's probably a robot), we finally had to resort to this system (it's called CAPTCHA I'm told). And now Mad doesn't have to clean out the comments system several times a a day. So I apologize for the inconvenience but can only say that it has proved necessary. As for Speed, I think your comments are valid if we look at the events of the past few days in isolation. But what we really witnessed was Scott finally getting sick of the constant criticism and blame from his bosses and putting his side of the story for the first time. 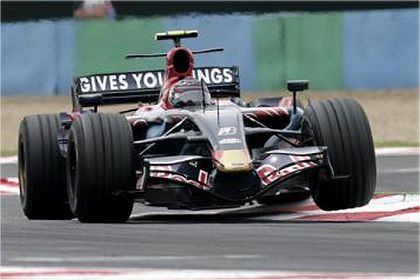 We have heard Tost's and Berger's opinions on their drivers all through the winter and during the 2007 season, but Liuzzi and Speed have never replied to the humiliation of what their bosses were saying to the media - until Tost's physical abuse made it clear to Speed that enough was enough. That shows admirable restraint on their part and speaks of a lot more character than displayed by the co-owners of STR. And I don't think Scott has just stepped back into the team as though nothing has happened. You can bet that apologies and promises of better treatment were required of Tost before Scott would agree to return. And I'm also prepared to suggest that the team will be a happier place to work, now that all this has been hammered out. Turning to Speed's feedback over the team radio, I have to say that everyone has their own style. Speed's may not sound very serious but it is certainly effective. He has been setting faster times in practice, qualifying better and racing further up the field than Liuzzi for most of this season - and that doesn't happen unless you are getting the set-up of the car right. He may seem like a teenage kid at times but his performances show that he is a good driver and is getting better all the time. It's interesting to see what position Speed finished in when he was able to finish the race, moving up 9 spots in one case. It would be interesting to see what position he was in at the time he retired from the other races, but I think it's clear from these stats that he generally finishes in a far better position than that which he qualified in. A race isn't all about one or two fast laps. When the car or unfortunate circumstances don't take him out, Speed manages to drive a good race, consistently moving up. As for his different style, maybe if there were more American drivers it wouldn't sound so foreign to fans. That's a very good point about Scott's "American-ness", Andrea. Statesiders are generally more direct and uninhibited in their approach than people in the Old World are used to and Scott is no exception. I know from experience that this can be quite disconcerting for Europeans at times and have often seen arguments develop over misunderstandings of what has been said. As Winston Churchill said of the Brits and the Americans: "We are two nations separated by a common language." As for Scott's race positions at the moment of his retirements, I may add these stats at some point. But it is worth pointing out that he has shown excellent starting form this year, invariably gaining several places on the first lap and then hanging on to them. I think it was great he was able to get all this out in the open. At the time there was a possibility that he would never race in F1 again, the replacement driver would have been cut some slack for being unfamiliar with the car. Sabatian (pardon the spelling) would have been brought in next year in a greatly improved car, and Scott would have been blamed for the cars performance. In a way I hope he is replaced by Bourdais so he too can fail. It seems the only way that people will truly understand. As for 'American-ness'. thats just a broad generalization. Most American's are just A**holes (at least the ones born here Clive). Californians are a totally different type. A little too weird if you ask me. Tost: Did you say tyre or Tie rod? Speed: Tya! the front tya is shot. Tost: I cant understand him...... Just tell the media it was his fault. LOL Dan, I love that version of the radio exchange! And you're probably right. I hear what you're saying about Americans but like them a lot more than you do, I think - even the Californians. Europeans can usually only distinguish between Southerners and Northerners and we tend to class you all together, not understanding the subtle differences that seem so obvious to you. But we're right on one thing: Americans are much more open and honest about what they think and feel than are Europeans - even the famously withdrawn New Englanders are open books in comparison to the English, for instance. And that can easily lead to Europeans thinking that Americans are brash and opinionated. They're not - they're just used to telling it like it is and expect everyone else to do the same! Like the site, just couldn't help but through a quick off topic comment about the "two countries seperated by a common language". It's actually Oscar Wilde rather than Churchill. It's from "The Canterville Ghost" in which he writes "We have really everything in common with America nowadays, except, of course, language." This was apparently modified to the common quote by George Bernard Shaw. Thanks for that, Alex - just goes to show I should check my sources! Might have guessed it would be Oscar Wilde as he had all the best quotes (and a modification by GBS also seems pretty fitting). And don't worry about straying off topic - I love diversions!